WINCHESTER, Va., October 17, 2013 – Trex Company, the world’s largest manufacturer of high-performance wood-alternative decking and railing, announced the introduction of new Trex® Spiral Stairs™ collection. The complete line of Trex Spiral Stairs is designed to enhance the beauty of any backyard, while also providing a functional, space-saving alternative to standard stairs. The system also is offered in both aluminum and galvanized steel models to suit the tastes – and budgets – of any homeowner. Engineered with an exclusive powder coat color palette, Trex Spiral Stairs are crafted to match the signature hues of Trex decking and railing. Designed to meld seamlessly with the pre-existing Trex decking and railing systems, the new stair line showcases exclusive options including a lip-up tread design to ensure the space between the risers does not exceed 4 inches. Furthermore, the line is designed to incorporate various components of Trex’s LED-dimmable Trex DeckLighting™ system, adding both style and safety to its surfaces and surrounding areas. With 12 different customizable options, the understated, contemporary design of Trex Spiral Stairs makes a strong fit for private residences, multi-family housing and commercial settings, while meeting strict code requirements that continue to be enacted in many cities across the U.S. In addition to saving space, Trex Spiral Stairs may also represent cost-savings to homeowners. As an all-in-one system, Trex Spiral Stairs do not require the additional decking and railing needed to construct traditional staircases. True to Trex’s eco-friendly legacy, steel models of Trex Spiral Stairs are manufactured of 25 percent recycled content, while aluminum models are manufactured of 60 percent recycled content. In addition, both the steel and aluminum models are 100 percent recyclable. 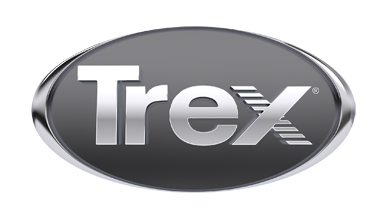 Trex Spiral Stairs are manufactured and sold by The Iron Shop, based in Pennsylvania, under a trademark licensing agreement with Trex. The system also comes with an all-inclusive 25-year craftsmanship and defects warranty and five-year all-inclusive finish warranty for additional peace of mind. For more information about Trex Spiral Stairs and other Trex products, visit trex.com. Since 1931, The Iron Shop has enjoyed a reputation for outstanding design and fabrication of custom-built spiral, curved and floating stairs. Today, The Iron Shop has grown to become the leading manufacturer of spiral stair kits, with over one hundred thousand satisfied customers worldwide. The Iron Shop's main plant and showroom, located just outside Philadelphia, has four regional showroom/warehouse locations near Los Angeles, Tampa, Houston and Chicago. For more information about The Iron Shop and its products, call 1-800-523-7427 or visit www.theironshop.com.